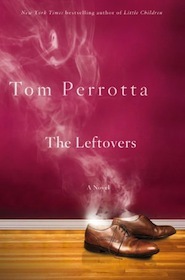 Tom Perrotta was edgy with Election, spooky with Little Children, and wry with The Abstinence Teacher With his latest, The Leftovers, he’s, um, well he’s trying, I guess. What is good about The Leftovers is what is good about every Perrotta novel – the keenness with which he observes and details the condition of the suburb-dwelling 21st century human being. Before The Leftovers begins, millions of people across the world have mysteriously vanished in what some people consider The Rapture. Perrotta catches up with them as they struggle with the disappearance of their loved ones and try to move on in their vastly changed world. I think part of the trouble comes from that premise. It’s decidedly more science-fictiony than anything Perrotta has done before. It’s an interesting idea, but one that falls flat at the three-quarters mark and results in an ending that feels forgettable, like he didn’t know how to wrap things up and just went with the first idea that came to him. All in all, The Leftovers isn’t a total dud. It’s just not on par with his previous work. I laughed out loud at the end of your first paragraph. Love it!